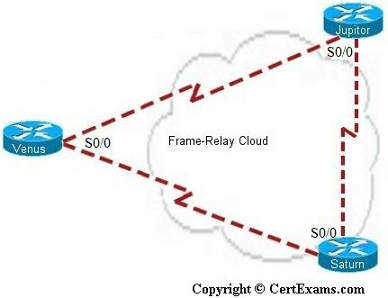 Description: Configure frame-relay using point-to-point sub-interfaces. This example uses 4 routers connected together in the form of a star using sub-interfaces. Note that on a frame-relay network without sub-interfaces, the LMI-type is automatically detected. Similarly, PVC DLCIs are learned through CMS status messages. There is no need to specify the same explicitly. On the otherhand, in a FR network with point-to-point sub-interface configurations, you need to specify the interface-dlci number. 3. Host Name Configuration screen appears enter the host name as “NY” and click save button. 4. Specify frame-relay encapsulation using Interface Management > Interface and Connections. In Interface Connection window select S0/0 interface and click Create New Connection button. This populates Serial 0/0 interface wizard click next > next > click frame-relay encapsulation then click next > next > next > finish button > click OK button. 6. Specify ip address using Interface Management > Interface and Connections. In Interface and Connections window click Edit Interface Connection Tab. Select the s0/0.1 interface and click Edit button. In Interface Feature Edit dialog specify ip address as 192.160.1.1 and click OK button. 7. Select Router > Frame-Relay Configuration from left navigation pane. 8. Select s0/0.1 interface from interface drop down box and enter dlci number as 62 and click OK button. 10. Specify ip address as 192.160.2.1 follow step 5 and 6.